In my last article, I presented Python programming using iPython. 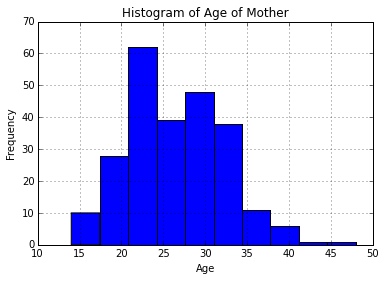 There, I used an example of logistic regression modeling for mothers with children having low birth weights. In this article, using the same example, I introduce Random Forest with iPython Notebook. Random Forest is a machine learning algorithm used for classification, regression, and feature selection. It’s an ensemble technique, meaning it combines the output of decision trees in order to get a stronger result. In simplistic terms, Random Forest works by averaging decision tree output. It also ranks an individual tree’s output, by comparing it to the known output from the training data, which allows it to rank features. With Random Forest, some of the decision trees will perform better. Therefore, the features within those trees will be deemed more important. A Random Forest that generalizes well will have a higher accuracy by each tree, and higher diversity among its trees. In this example, we are going to train a Random Forest classification algorithm to predict the class in the test data. The dataset I chose for this example in Longitudinal Low Birth Weight Study (CLSLOWBWT.DAT). [Hosmer and Lemeshow (2000) Applied Logistic Regression: Second Edition.] These data arecopyrighted by John Wiley & Sons Inc. and must be acknowledged and used accordingly. I have split the data so each class is represented by a training set and testing set: train1 is the half of the set (245 rows) and test1 is the other half (245 rows). 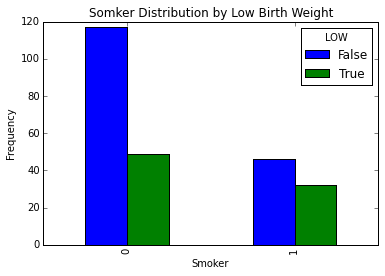 In this example, we want to predict Low Birth Weight using the remaining dataset variables. 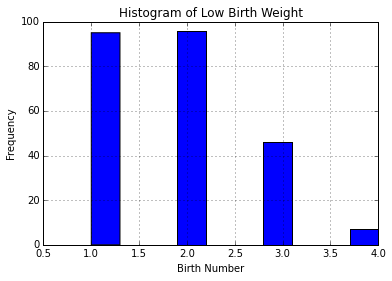 Low Birth Weight, the dependent variable, 1 = BWT <=2500g and 0 = BWT >2500g. Note – you have to have scikit-learn, pandas, numPy, and sciPy installed for this example. You can install them all easily using pip (‘pip install sciPy’, etc). You could also download anacondas. Now let’s import the dataset using Pandas or pd. Before we delve into modeling, let’s explore the data a little. We will use histograms to do this, and plot them within the Notebook. Let’s take a look at the distribution of smokers for those having children with low birth weights versus those who do not. The data from the training set has to be put into numpy arrays in order for the Random Forest algorithm to accept it. Also, the dependent variable array must be a 1d, as opposed to a column vector. train.as.matrix() will execute the array and ravel() will convert vector array into a 1d array. Now, we fit the data using Random Forest. We prepare the testing data the way with did for the training data. We now need to predict class labels for the test set. We will also generate the class probabilities, just to take a look. Finally, we check the accuracy on the test set and generate evaluation metrics. Though this will not always happen, our predictions appear to be perfect. The Random Forest algorithm predicted class perfectly with this dataset. That is unlikely to happen with larger datasets, e.g., more records and more variables. Sometimes in machine learning, models will be overfitted. That is, we may build our models too specific to the training data, and the model takes on the random gradations of the training data. This can cause problems when we try to generalize the model. As good practice, if your initial dataset is a large enough, we split the data into training and test data.